Last week, the Obama administration released new energy efficiency standards for microwaves, along with an update to the government’s official Social Cost of Carbon (SCC) figure. What do those two things have to do with each other? Well, the efficiency standards will help the planet by cutting the energy needs of microwaves, which will in turn save consumers money. And the new SCC numbers show just how expensive our addiction to fossil fuels has become. The SCC is used to estimate the damages from carbon emissions (and the benefits from reducing those emissions) for the purposes of regulatory benefit-cost analyses. The central estimate for the SCC is now around $35 per ton of carbon dioxide pollution emitted today. That’s the administration’s estimate of the damage—to human health, ecosystems, and the economy—caused by every ton of carbon dioxide emitted into the atmosphere. The average American emits about 20 tons each year. The new cost of carbon figure is a welcome step forward, reflecting the latest versions of the underlying models. The bad news is that the increased number also shows that our lack of a comprehensive climate policy is becoming ever more costly. Moreover, this updated SCC number underestimates the true costs of carbon emissions. For example, the current SCC quickly rises to $55 per ton under a lower discount rate (that is, an estimate that doesn’t “discount” harms to the wealth and health of future generations by quite as much as the administration did in reaching its $35 per ton figure). The value of one ton of carbon dioxide would rise higher still with a declining discount rate, something that, in line with the general consensus among economists, would more closely reflect the true costs of climate change. And none of that includes the cost of extreme climate events. The good news: the administration’s latest numbers show exactly how policy analysis should be done—rigorously and consistent with the latest advances in science and economics. For example, instead of using older versions of three main SCC models to calculate its official number, the administration now uses the most recent peer-reviewed versions of each. That simple but important step helps to bring the new official SCC more in line with the latest academic literature. In short, the administration’s economics are slowly and carefully catching up with what we all can see outside our windows. While atmospheric carbon dioxide levels have just passed the 400 parts per million threshold for the first time in over 3 million years, the real costs of climate change keep piling on. What the country really needs, of course, is for Congress to pass a comprehensive climate policy. Only then will Americans stop living in a world where their personal behavior leads to socialized costs of at least $35 for each of the 20 tons of carbon dioxide we emit every year. 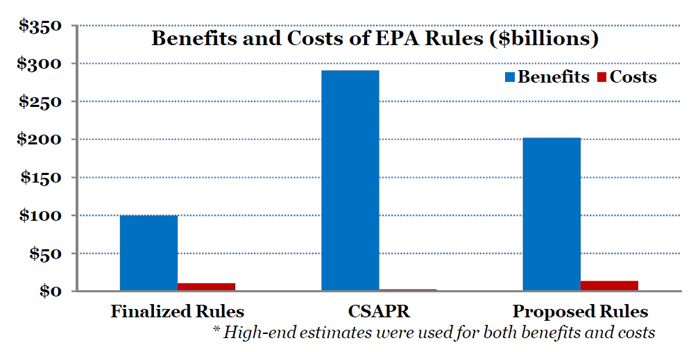 Until then, the Obama administration is right to at least include these costs in its own regulatory impact assessments. The Office of Management and Budget is nerd heaven: a bunch of people getting their professional kicks from analyzing federal regulation. This bean counting may sound painfully lacking in glamour, but it’s incredibly important. OMB’s annual report to Congress on the benefits and costs of all major rules adopted by most federal agencies over the past 10 years shows how efficiently, or inefficiently, those agencies are functioning. And the conclusion is clear: the Environmental Protection Agency comes out on top. One of the driving forces behind this rule is the Mercury and Air Toxics Standards, an extraordinary achievement for clean air and public health. Because of these standards, all coal fired power plants will for the first time be required to control their emissions of toxic air pollutants — including mercury, arsenic and acid gases. Forty years after the Clean Air Act signed by Richard Nixon, twenty after the landmark Amendments signed by George H.W. Bush, we are finally getting around to regulating mercury from burning coal. The analysis of the benefits of reducing mercury pollution demonstrates just how much we underestimate the benefits of environmental protections. For example, when it comes to reducing mercury pollution, the benefits are based on EPA’s estimates of increased wages of (higher IQ) children born to families that catch freshwater fish for their own consumption. Costs, by the way, are relatively well estimated, since businesses are all-too willing to share them. So yes, there are costs—but they are small relative to benefits. And costs, as opposed to benefits, are typically overestimates. They are largely based on current available control technologies. They don’t consider that industry may invent an entirely new and unexpected way of complying with regulations at lower cost. This happens over and over again, and it comes with a name: entrepreneurial ingenuity. Works every time. For every dollar invested, Americans get $10 worth of benefits. I’ll take that ratio any day. This blog was originally posted on EDF’s Energy Exchange blog. Oil and gas exploration and production is rapidly expanding across the U.S. due to technological developments that have made extraction of previously untapped unconventional resources such as shale gas feasible. But national clean air standards covering these activities have not been updated since 1985 in one case and 1999 in another. They are limited, inadequate, and out of date, particularly given recent technological advances in this area. This poses a serious problem, since exploration and production activities emit numerous hazardous air pollutants and other airborne contaminants that threaten human health and the environment. Communities across the country are paying the price, suffering from air pollution in the absence of protective, comprehensive standards. I testified at the EPA hearing in Pittsburgh where compelling concerns were raised by many in the communities hard hit by air pollution impacts. People in communities across Pennsylvania expressed concern that adequate protection from dangerous pollution in their home state is simply not in place. Some pleaded with the EPA to finalize new standards, others expressed anger that EPA has not done so already, and many fear that the new standards won’t be tough enough to keep their families safe. The individual who testified before me declared that when it comes to our health and that of our children, the costs of cleaning up harmful pollution should not factor into EPA’s decision-making. He got a standing ovation. Of course, the hearing also featured industry representatives, some of whom echoed the position of the American Petroleum Institute (API) calling for more time to comment on the proposed standards and to delay their implementation. Yet, the truth is that the proposed EPA rules will standardize many practices and technologies already being used in states such as Colorado and Wyoming, and elsewhere by natural gas companies. Further, these practices and technologies reduce gas losses, which results in greater recovery and sale of natural gas, and thus increased economic gains. The return on the initial investment for many of these practices is sometimes as short as a few months and almost always less than two years. In these tough economic times, it would seem wise to eliminate waste, save money, and reduce environmental impact. Based on EPA estimates of natural gas losses, industry lost more than $1 billion in profits in 2009 due to venting, flaring and fugitive emissions. The U.S. Government Accountability Office (GAO), with supporting data from EPA, estimates that around 40% of natural gas estimated to be vented and flared on onshore federal leases could be economically captured with currently available control technologies. Recouping these losses could increase federal royalty payments by $23 million annually, at a time when revenue is desperately needed. The industry can demonstrate their commitment to bringing natural gas to market in an environmentally sound way by using best practices, acknowledging the benefits of these safeguards, and being proactive in helping them get adopted. And, while EPA’s proposed rules are a great start, there is room for improvement (for more details, see EDF’s preliminary analysis of the regulations). Bottom line: it is critical that stronger clean air standards move forward. They are vitally important to protect human health and the environment.